Published by Paul John Whisky, USA on May 29, 2018. 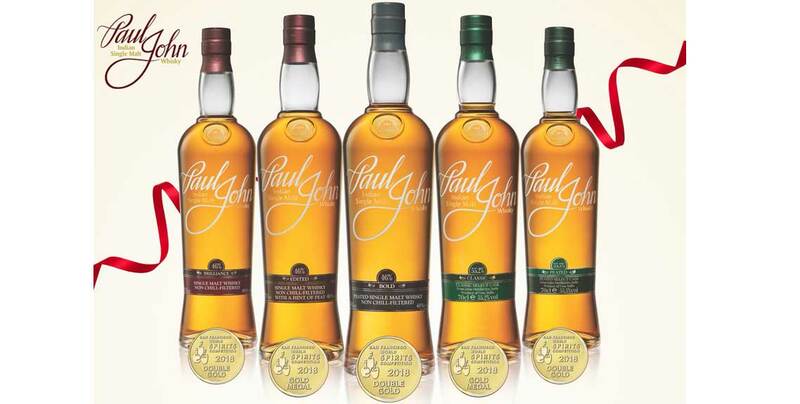 Paul John Flagship Expressions BRILLIANCE & BOLD and Select Cask PEATED received the exceptional and prestigious Double Gold medal at the highly recognized San Francisco World Spirits Competition 2018. Our other expressions Paul John Edited and Select Cask Classic won Gold Medals while Our Zodiac Series Kanya won the Silver Medal. This is the second consecutive year where all our expressions have earned a medal at the San Francisco World Spirits Competition. Select Cask Peated had bagged the Double Gold medal in the 2017 San Francisco World Spirits Competition as well. Winning medals from this prestigious SFWS committee is an extremely great achievement for John Distilleries. The competition received more than 2200 entries this year and we are tremendously proud to emerge as winners. Established in 2000, San Francisco World Spirits Competition is the oldest and the most influential international spirits competition in United States of America. The jury comprises of seasonal experts in the spirits industry. The judging is based on a blind tasting where the whiskies are evaluated on an individual basis and not compared with the other entries. A Double Gold Medal is awarded to an entry when a Gold Medal rating is received by all the members of the judging panel. Paul John Single Malt Whisky is an award-winning premium spirit distilled in the tropics of Goa, India. Crafted from six-row barley grains that are grown across the vast lands of Rajasthan and the foothills of the Himalayas, this superb single malt is aged for a minimum of five years. Carefully crafted during each stage of the whiskey-making process, its sweet and smoky aromatics have made this award-winning whisky a standout among connoisseurs and whisky lovers around the world. Paul John Single Malts have been rated Liquid Gold and the latest release Kanya has won Best Asian Whisky Award 2018 by Jim Murray, Whisky Bible. In 2017 San Francisco World Spirits Competition, our Bold Expression received the ‘Best Other Whisky’, Edited and Select Cask Peated won the Double Gold medals and Brilliance and Select Cask Classic each won Silver medals.